What else can I get you today? One of the simplest ways to increase your revenue is to make sure your clients know about other services offered by you or your firm, aka “cross-selling”. Cross-selling is good for the client who needs additional services and might not know you offer them, and it’s obviously good for you. Cross-selling can add decimal points to your bottom line, even if only a small percentage of clients “buy” your other services. Don’t let the “selling” throw you. Just let your clients (and prospects) know “what else” you do. On your website, you can highlight links to pages that describe the other services. You can talk about the services in your newsletter. You can mention other services to the client at the end of the case or engagement. No pressure. Here’s something else we do, would you like to get some information? Now, if you only offer one service or group of closely-related services, if you don’t have any other practice areas, if you don’t work in a firm, you’re not out of luck. Find other lawyers you trust and are willing to recommend and cross-sell their services to your clients and prospects. If they offer (and you can accept) referral fees, great. If not, see if they are willing to cross-sell your services to their clients. Keep your clients happy. Deliver good results. Service (with a smile). Do a good job for your clients and you will be well-paid for your work. Yes, but that’s not the whole story. You work for your clients, it’s true, but your clients also work for you. Oh, not literally, but that should be your attitude. You should expect that your clients will do things for you beyond merely paying your bill (on time). You should expect them to provide a positive review about you, for example, on one or more review sites. You should expect that they will provide you with a written testimonial, and give you permission to use it in your marketing. You should expect that they will “like” and “share” and “upvote” your articles, posts, videos, and other content, promoting you to their friends and followers and social media connections. If they have a blog or channel, you should expect them to mention you or interview you or offer you a guest post. You should expect them to tell their friends and clients about you, pass out your cards and brochures, and refer people who need your help. Now, some lawyers actually talk to their clients about these things. They ask them to share and post and refer. There are ways to do that without making either the lawyer or client feel uncomfortable. But you don’t have to ask. When you expect clients to refer, even if you never come right out and ask them to do it, they’ll pick up on the idea and come through for you. I call it “building a referral culture in your practice” and I talk about this in my (free) referral marketing course. Here’s the link to the course. Some of your clients are holding back on you. They know people who need your services but they don’t refer them. More importantly, do you know what to do about it? 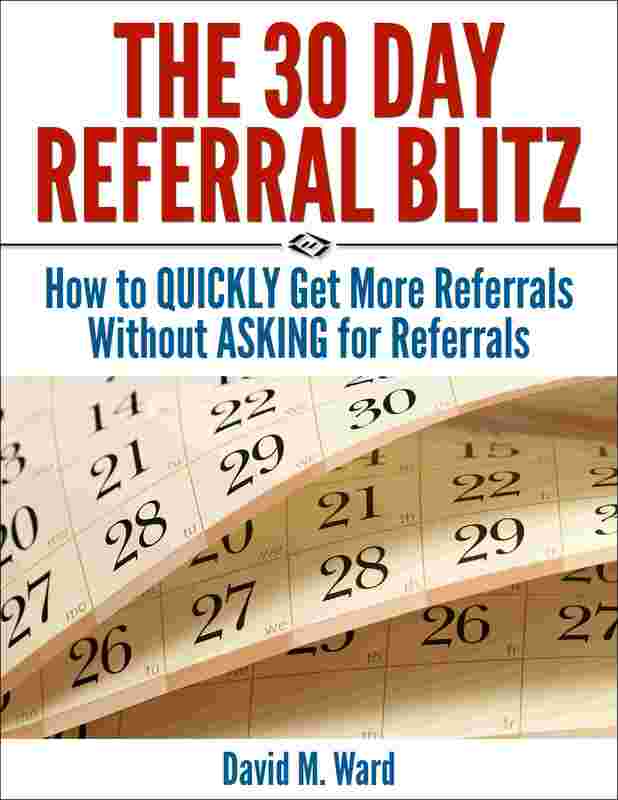 Yes, asking your clients for referrals will work. But we both know you don’t want to do that. You don’t want your clients to think you “need” business, or you don’t want to be “pushy”. Even though I can teach you ways to ask for referrals that won’t make you (or your clients) uncomfortable, you wish there was another way. I just created a video course on how to get more referrals from your clients–without asking. The course is 90-minutes and (for now), it’s free. You can get it here. You’ll learn a simple 3-step system that works for any practice. And you can start using it immediately. Let me know what you think about the course or if you have any questions. 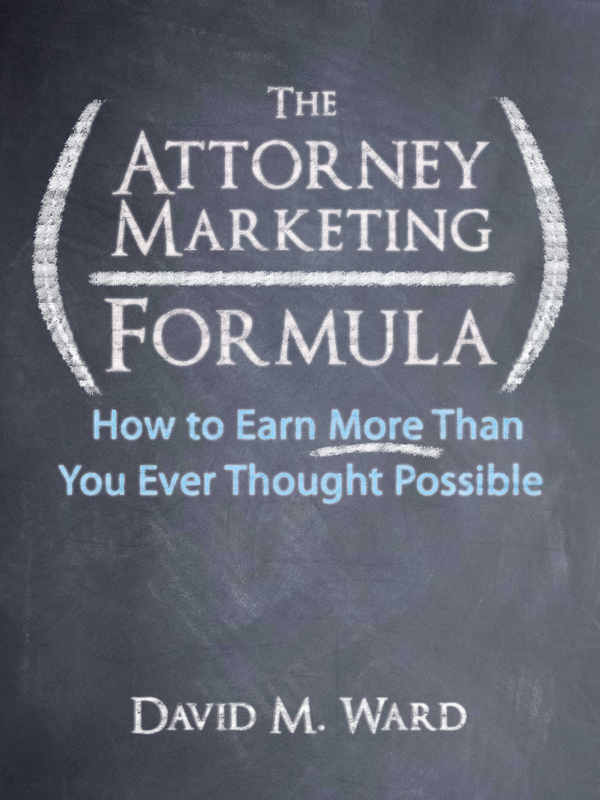 Are you concerned that there too many attorneys in your market? Don’t be. As long as there is demand for the legal work you perform, it doesn’t matter how many other attorneys there are competing for it. The reason? Clients buy you before they buy your services, and you are unique. Build relationships with prospective clients and referral sources and you will effectively have no competition. But hold on. Having competition is good. It’s good because the existence of competition proves the existence of demand. If the work wasn’t there, the other attorneys would find something else to do. Having competition is also good because it forces you to find ways to differentiate yourself. When you do, marketing is easier and more effective because you are able to show your market an advantage to choosing you. Your competitors can also provide a fertile source of ideas. Follow them on social, subscribe to their newsletters, study their ads and blog posts, and discover what they’re doing that you can do better or differently, or discover market segments they have overlooked. Meet your competition and get to know them. Find out what they need and how you can help them. They can become a source of referrals (conflicts, clients that are too big or too small, etc.) for both of you. And, if you find yourself on the opposite sides of a case, your relationship might help you reach a better resolution. Don’t worry about the competition. Embrace it. Successful estate planning attorneys regularly contact their clients to inquire about life changes that might necessitate an update to their plan. No matter what area you practice in, you should do something similar. Once a year (at least), send your clients information about changes in the law and a questionnaire. Invite them to talk to you. Do this even if your handle litigation or bankruptcy or another area where your clients are unlikely to need you again. So you can find out about other issues or changes in their life or business that necessitate a referral to another attorney or to another professional. Create your questionnaire or “legal checkup” checklist by asking other professionals to provide information. Ask an insurance broker, for example, for a list of questions your clients should ask themselves about their current risk-levels and coverage. Ask a CPA for questions related to taxes, a financial planner about investments or retirement, and other attorneys about their practice areas. In addition to asking your “referral partners” to help you prepare your legal checkup, ask them to provide a special offer for your clients, if appropriate. A free consultation or document review, for example. Once you’ve got your legal checkup up and running, help your referral partners do the same thing for their clients. An annual legal checkup will allow you to better protect and advise your clients and stimulate referrals to you and your referral sources. No matter what type of practice you have, you should seek out and befriend estate planning attorneys. Because estate planning attorneys have clients who need what you do and can usually afford to hire you. Damages from wage loss, business loss, or divorce are often higher. Because estate planning attorneys don’t have to wait for “something” to happen, ie., a loss, litigation, which means they have a bigger universe of prospective clients available to them. Because estate planning attorneys often do types of marketing you may not do (seminars, advertising, direct mail), bringing in a steady stream of new clients they can refer. Because estate planning attorneys usually offer services at different price points, appealing to a wider spectrum of clients. Because estate planning attorneys usually write a newsletter and/or otherwise stay in touch with their clients and prospects, giving them more opportunities to tell people about you and what you offer. Because estate planning attorneys network with many other professionals they can introduce you to. Because estate planning clients associate with people of similar age, background, income, and need for estate planning, so estate planning attorneys usually get more referrals they can refer to you. Because most of your clients will need estate planning someday and you’ll want to have someone to whom you can refer them. If you’re looking to build your network of professional contacts, estate planning attorneys are a good place to start. If you are an estate planning attorney, now you know what you have to offer other attorneys. Say ‘thank you’ for referrals. Loudly. One of the best ways to get more referrals is to thank the people who provide them. Do it quickly, sincerely, and appropriately. Make the referral-giver feel appreciated for their gesture and they’ll be more likely to do it again. In addition, let your other clients and contacts know that you regularly get referrals and that you appreciate them. Find ways to mention it in your newsletter, on your website, and in conversation. When a professional sends you a referral, thank them, by name, in your newsletter, and give their practice a plug. In your new client kit, describe how to identify someone who could use your help and how to make a referral. Mention that you get most of your clients through referrals and how much you appreciate your clients for supporting you. It’s simple. Find ways to talk about referrals and you’ll get more referrals. Where will you be in six months? Either way, you want more business. No problem. You have a list of lawyers and other professionals who have clients that are a good match for you. They can send you referrals. Most of these professionals have colleagues who are similarly situated. They can introduce you to them. Most of these professionals know your name and what you do. They know you’re good at your job. Some of them have met you, either in person or online. Some could be considered friends. So, you make some calls. You re-introduce yourself or tell them you’re checking in to see how they’re doing. You ask what they need or want and how you can help. Do they need clients or customers? Introductions, recommendations or advice? You do what you can to help them. They ask how you’re doing. They ask what they can do to help you. They send you referrals. They introduce you to their colleagues. They give you advice and recommendations. Your practice grows. You want that list, don’t you? It sounds like just what you need. There’s just one thing. That list isn’t going to make itself. You need to do that. Better get started. It will be six months from now before you know it. 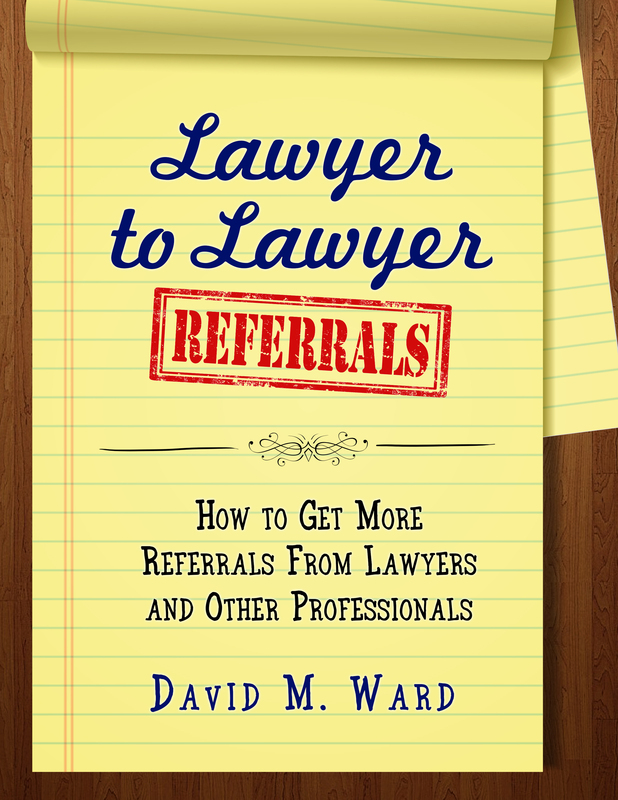 In Lawyer to Lawyer Referrals, I show you how to find and befriend lawyers who work in complementary practice areas and can send you referrals. One way to get on their radar, and in their good graces, is to help them do a better job for their clients. Educate them about your area of expertise, even if that means they help those clients instead of referring them to you. It’s similar to what I said yesterday about encouraging clients and prospects to call you for “micro-advice,” without the meter running. It seems counterintuitive to share your time and expertise with lawyers who do what you do, or want to. But not only does it feel good to help others, it can pay dividends. Anyway, great advice from a very smart guy. If you want more of his advice for building a successful practice, read my interview with him in my Kindle book. Do you charge for “micro advice”? 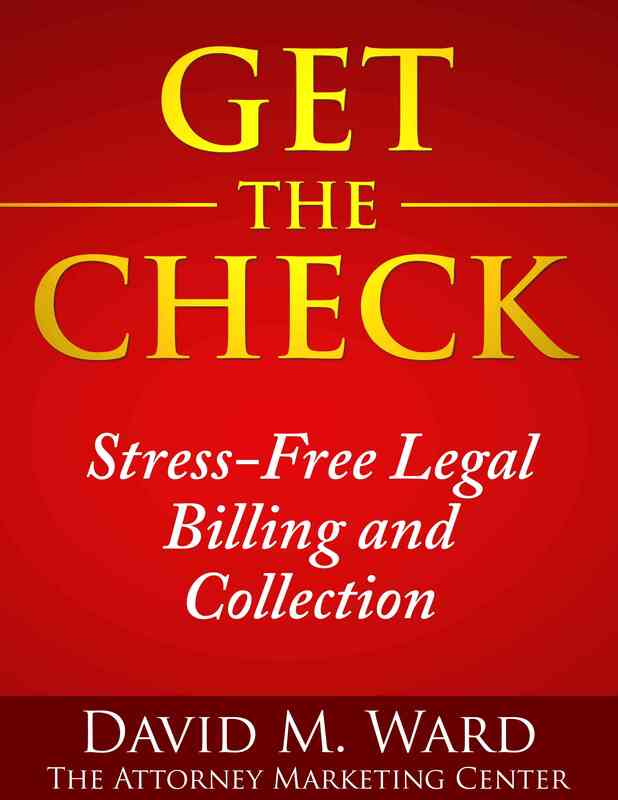 Many business attorneys won’t talk to a client without the meter running. So many clients don’t call their attorney before they make important decisions, often to their detriment. The client then has to pay the attorney to fix their mess, often a lot more than they would have paid had they gotten advice in advance. In the short term, the attorney makes out. In the long run, maybe there’s a better way for both client and attorney. What if attorneys let their clients know they won’t charge them for “micro advice”? A quick call to find out if they’re going in the right direction, a question or two to see if they do (or don’t) need something else? I heard that’s what many smart business attorneys do. 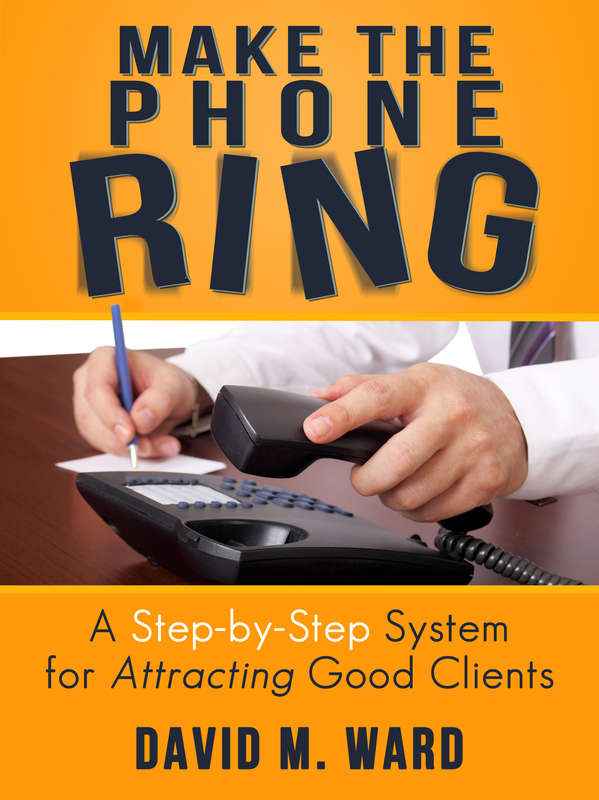 You want your clients to call you often and they’re more likely to do that if they know they won’t be charged by the nanosecond. Maybe they have something that needs your help, maybe they don’t, but it’s better for both of you to find out. How is this better for you? For one thing, it builds trust. The client sees that you’re looking out for them, not just sucking them dry. It can also lead to more work for you. In the short term, if they need your help, you’ll be able to show them why. In the long run, by looking out for your clients, you help their business grow and you can grow with them. Yes, some clients will (try to) take advantage of you. You will have some line drawing to do. But most clients will appreciate you for “not being like all those other attorneys”. You’ll earn their loyalty and their referrals. 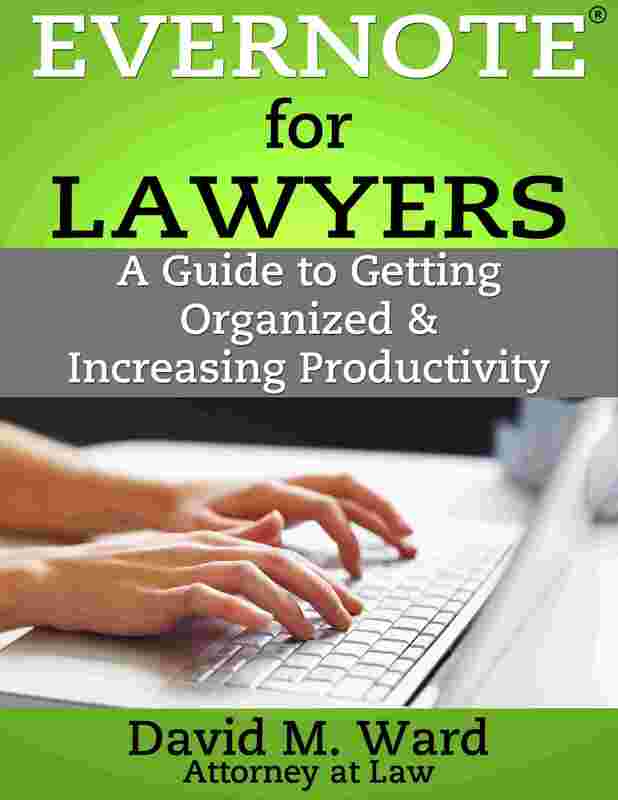 This isn’t just for business attorneys. It’s a good policy for all clients. Even one-off clients can send referrals.